Its cat of the month time again. 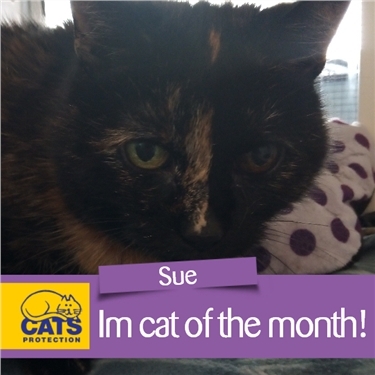 September's star is (drumroll please).... Sue! Sue has been with us since March, and she is 7 years old. She was brought to us originally because her owner developed an allergy to her. His ideal home is one without other pets and children, with access to the outdoors. She enjoys being outside, but doesnt wander far- she just likes to feel the breeze in her fur! She takes her time getting to know you, but once she does- she was described as a little lap cat.